In January we celebrate Martin Luther King Day. Then in February, we have Black History Month. These two months give families the opportunity to explore a number of themes and have some interesting meal time, car time, and bedtime conversations. During the months of January and February, you can introduce your family to Dr. Martin Luther King and the Civil Rights movement. You could also introduce them to many other famous African Americans. Some possibilities are Rosa Parks, George Washington Carver, Sara Breedlove Walker, Joseph Winters, Dr. Mae Jemison, and Sidney Poitier. You can find free color pages and short biographies online. This is also a good time to talk about dreams and how people turn dreams into reality. Your children each have dreams, and this is a great opportunity for them to explore what some of their dreams are. You can also talk about your dreams for your family. Another theme that would work well during these two months is the topic of peace. How does your family view war and peace? What does your religion teach or what are your personal core values concerning peace in a family, your neighborhood or the world? Dr. Martin Luther King Jr. was a Baptist minister and one of the most influential leaders in the American civil rights movement in the 1960s. Dr. King’s message of racial equality was not always well accepted by all Americans. Even so, he preached to his followers to embrace nonviolence and to use peaceful demonstration to make positive change. 2. Have a Multicultural Banquet on Martin Luther King Day – Martin Luther King’s goal was to help Americans like each other even if they had differences in skin color, religion or background. Celebrate his birthday with a dinner featuring food from other countries or geographical regions. For example, if you like to cook and have the time, you could serve Puerto Rican rice-and-beans, Boston clam chowder, Italian spaghetti, Chinese Chow Mein, and a peach pie from Dr. King’s native Atlanta. Dinner doesn’t need to be time-consuming though. You can achieve almost the same effect by stopping for takeout from Kentucky Fried Chicken, Taco Bell, Café Rio, and your local pizza parlor (Italian or Greek). 3. Do something good as a family to celebrate Martin Luther King Day – You could raise money for a local charity or nonprofit organization that your children care about by having a neighborhood walk. Ask relatives and neighbors to sponsor your family for a certain amount of money per mile (or block). The cause is different than what Dr. King fought for but the message to your children will be the same: “When we all march together, we can change things.” Make sure the distance you choose is realistic for the ages of the children involved, but also long enough so they appreciate that old saying of the Civil Rights era: “My feets is tired but my soul is rested.” When you turn in your donation, make sure you note that it is made in honor of Dr. King’s memory. 4. Make a multicolor handprint wreath to hang on your door on Martin Luther King Day or during the whole month of January and February. 5. 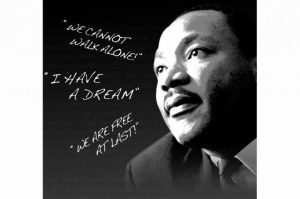 Make and play a Martin Luther King Day Game – Use facts you gather about Dr. King to make and play Martin’s Match Game on Martin Luther King Day. Turn all the cards face down and try to match “Open Door” cards with positive situations and “Closed Door” cards with obstacles. If no match is made, the cards are turned face down again. The player with the most matches wins. By the time you are through playing this game, you will be an expert on the extraordinary life of Dr. Martin Luther King, Jr! 6. Make a jigsaw puzzle of a picture of Martin Luther King and have someone in your family try to put it together. 1. Make an origami peace dove. You can watch a how-to video here. 2. 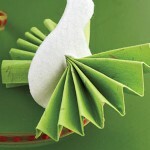 Make a felt and paper dove to hang in your room or use as a table decoration. • 4 X 6 inch piece of heavy green paper or card stock. Find a drawing of a dove online and then trace the pattern onto felt and cut out; cut a slit with a craft knife through the center where marked on the pattern. Fold paper lengthwise into accordion folds about 3/4 inch deep. Insert folded paper through the slit so paper extends evenly on both sides. 3. Make a Mosaic dove. Just draw a dove and fill it in using craft glue and colored broken egg shells or beads. If you want your dove to be in a frame, ask the butcher in your local grocery for a foam try. Draw your dove on the foam tray and use your glue and shells or beads to fill it in. You can add a hanger by punching two small holes at the top of the tray and stringing a piece of yarn through. 1. 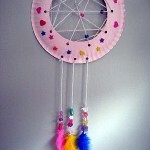 Make a dream catcher from a paper plate. You will use the inside of the hoop, the one without the metal. Take the lace and tie one end to the hoop. Start winding the lace around the hoop. Create the pattern as you go. Put one bead on the lace when you are about halfway done. 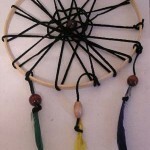 This will be the center that catches the bad dreams. Finish looping and weaving the lace until you get the look you want. To create a pattern around the center of your dream catcher weave the lace in a circular pattern through the middle of your dream catcher. 3. Have each family member write a poem about dreams. Then have a special night to share them and have treats. For children who can’t write have them tell you their thoughts and write them down for them or have them draw and color a picture about dreams. 4. 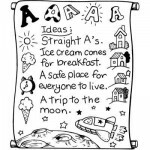 Talk about your dreams as a family and then make an “I have a dream scroll”. It would be fun to make a family scroll and then hang it in your home to remind you about your goals as a family as well as individual scrolls. Use markers or colored pencils to write your dreams on a piece of drawing paper. Some of your dreams may be serious and some may be silly. Draw a picture to illustrate each dream you write down. For example, if one of your dreams is for clean air, water, and earth, then draw the world. After you have written down your dreams, display them on a scroll by taping a wooden dowel to the top and bottom edge of the paper.